This is the third Sergeant Studer mystery to be translated by Mike Mitchell, and published by Bitter Lemon Press. Originally published in serial form in the 1930s in it's original German, 2006 is the first time it's been published in English. It seems Studer was once quite high ranking in the Swiss police but something to do with a bank led to him being demoted and he has now worked himself back to Sergeant level. His colleagues affectionately think he has a screw loose. The book opens with Studer in Paris, just before New Year, dining with colleagues from the French police. His friends are helping Studer celebrate the birth of his first grandchild. They are joined by a fellow Swiss, a priest called Father Matthias who believes he may have need of the police when he returns home to Switzerland. Father Matthias has recently returned from working in the Foreign Legion in Africa and tells a tale of a 'clairvoyant corporal' who has told him that his brother, long dead from fever, will return and his brother's two ex-wives will die. Studer does not seem to take this story seriously but sure enough it starts to become true. The ex-wife and widow of Father Matthias's brother both die under suspicious circumstances and Studer is at the scene of both. He keeps bumping into Father Matthias but he can't quite trust him. He is also enamoured, in a fatherly way, of Marie, Father Matthias's niece and wants to help her. It takes a while, and the promise of treasure, for Studer's investigation to get into gear but then he's all action and takes a terrible risk by travelling back to where the story began, in the desert of Africa. 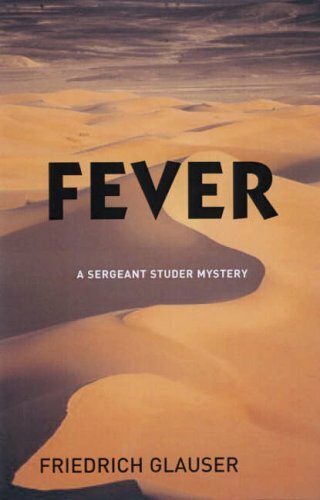 FEVER has a complicated plot with characters having many names and I'm not quite sure if I understood it all but it was the author's voice that engrossed me as well as a glimpse of Europe a few years prior to World War Two. "I have some information," the lady said, twisting and turning her slim body - Studer found himself looking round for the Indian fakir playing the flute to charm this cobra. "...Sergeant Studer said farewell to his loyal travelling companion, his scuffed pigskin suitcase. It was a silent but emotional farewell. Things often have more heart than human beings: every wrinkle that years of use had etched into its leather puckered up - but it didn't cry. Suitcases don't cry, suitcases content themselves with a woebegone, reproachful look." I look forward to reading the earlier two books - THE THUMBPRINT and IN MATTO'S REALM - and hope the remaining two Studer books will also be translated.